What is “beauty”? At Naturally Susan’s, beauty is about being natural. Letting your true self glow from the inside and out. It’s about embracing nature and what nature has given to us. What does beauty mean to you? We would like to know! ~ What does “beauty” mean to you? ~ What’s your favorite beauty routine? ~ What beauty tip would you like to share with NS Fans? 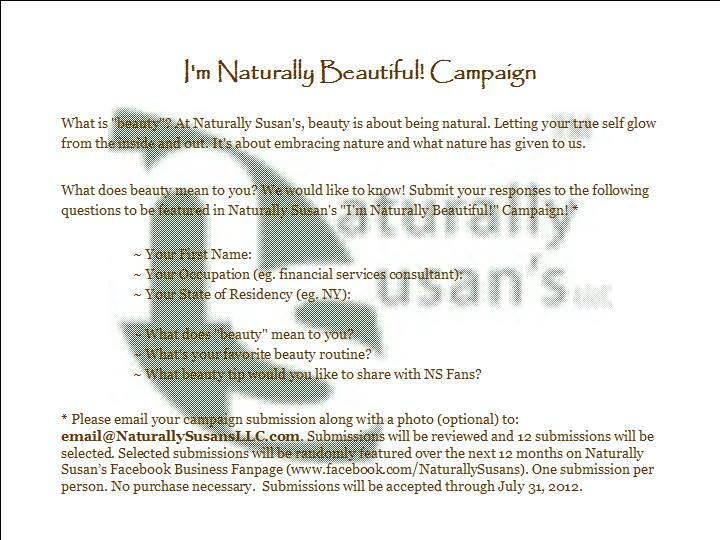 * Please email your campaign submission along with a photo (optional) to: email@NaturallySusansLLC.com. Submissions will be reviewed and will be randomly featured over the next 12 months on Naturally Susan’s Facebook Fanpage (www.facebook.com/NaturallySusans). One submission per person. No purchase necessary. Submissions will be accepted through July 31, 2012.